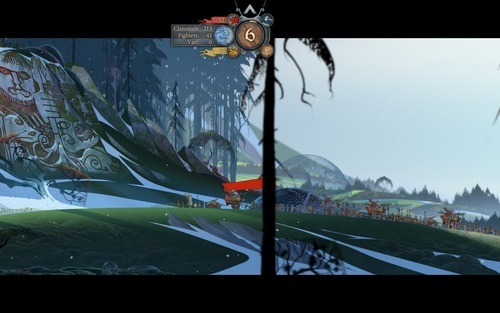 A little strategy game with some good old decision-making weaved in, The Banner Saga has style by the bucket and spends a great deal to construct an interesting world around familiar and simple good gameplay mechanics. I would compare this game to a Fire Emblem, or maybe a Final Fantasy Tactics; you choose units to send in battle, then place them on a grid, and they move one after the other, use special abilities and passive powers to defeat all enemies, then you win. Between fights, you move around, manage resources, buy items, make decisions and watch a bunch of cutscenes. I was a bit confused by the beginning of the game and for a while I was unsure which character I was supposed to be - if any - but that’s just because the game starts in the heat of action. The battle system is fine and simple. You can spend “will” to move farther during your turn, to attack for more damage, and to use skills. You can rest to recover will. Characters have armor and strength and you have to balance attacking both these stats separately. Strength represents effectively your hits points and your damage, and if you have a ton of armor, attacks against you can miss. It’s an interesting mix of things I know and things I have to think about constantly. Only small complaint, I wish I could see the whole range that all enemies can reach during their movement. Also I find weird that you alternate turns between allies and enemies. There should be some initiative or speed stat to calculate that. When you kill enough enemies, you level up and get a few points to place into one of the five stats. It’s all very well explained, although I don’t feel like the stats change your characters with only small increments. Stats like exertion allow you to use more will per turn and base armor-breaking power feel a bit useless to me, but no doubt that someone else would make them part of their strategy, myself I just put everything into strength and armor. Each character has two skills, one passive and one active, and you can boost the active one as you gain levels. Why not have passive skill levels too? Being higher level also lets you use higher level items. The items are bought with renown, which is also used to level your characters and feed your army, so you have to decide whether they’re worth a purchase or not. Items seem to confer really good passive bonuses like a chance to dodge attacks, bonus to stats, more aggro, and other things. 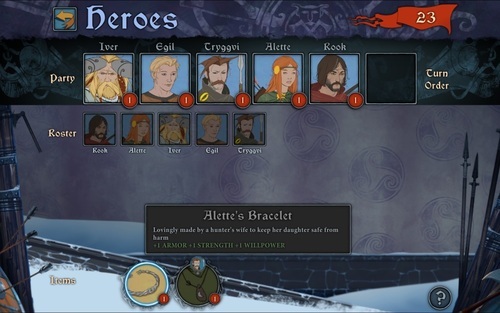 I wish you could see stats for your heroes in the preparations screen, especially when I get new heroes for a fight and I want to know if they’re worth adding to my party. And then there’s everything around the fighting - talking, making choices, deciding whether you’re giving provisions to soldiers leaving your wagon or trying to prevent them from going. Maybe if there were reputation meters for certain characters I’d feel like choosing my answers to everything carefully, but if all you’re gaining/losing are resources and clansmen, I don’t feel like this system had a big impact on me. As long as I could get the fights over, it didn’t matter much what I answered. It’s not a terrible problem, since the battle system is pretty good.